Regardless of the reason, getting pulled over can be a frightening experience. In Arizona, it can be especially frightening if the officer suspects you’re impaired; Arizona has some of the harshest DUI laws and penalties in the country. Arizona DUI charges will have you facing AT LEAST one day of jail time; 90-day license suspension; one year of ignition interlock use and maintenance; fines; fees; alcohol education and treatment; and a period of probation. Although the best way to avoid a DUI is to avoid getting behind the wheel after consuming any amount of alcohol or drugs, it is still important to know your rights if you find yourself pulled over. In general, it’s advised to talk to the police as little as possible during a traffic stop, especially if you have been drinking. You should comply with police instructions, but you may be surprised at the actions you don’t have to take once you’ve been pulled over. 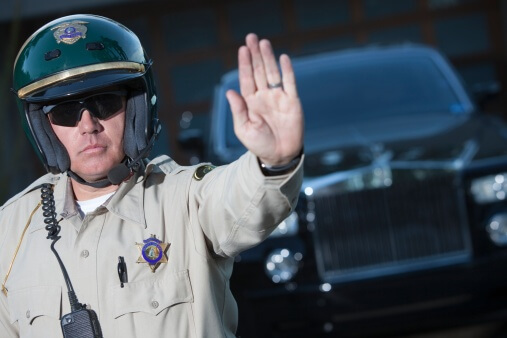 When you are pulled over, you should be courteous and compliant with the police, but you do not have to answer questions or provide personal information beyond your identity, vehicle registration, and insurance. Hand over all requested paperwork when asked, and step out of the car if the officer requests it. You have the right to ask for an attorney, and you should ALWAYS take advantage of this right to protect yourself. Always be respectful and calm throughout the stop, as any of your statements or actions can be used against you in court as evidence of impairment, even if you hadn’t been drinking prior to getting pulled over. Only after being arrested for suspicion of DUI, should you must participate in a blood or breath test. Prior to arrest, you do not have to take part in any roadside sobriety tests, such as walking a straight line, balancing on one foot, reciting the alphabet, etc. You do not have to allow the police officer to look into your eyes, or follow his finger while he checks your pupils with a flashlight (HGN). You do not have to participate in a breath test via the handheld PBT (Preliminary Breath Testing instrument). You also do not have to allow police to enter or search your vehicle without your explicit consent, if they really want to search your vehicle, let them get a warrant, do not consent. Steven D. West, attorney at law, can help build your best defense against a DUI, starting at your traffic stop. To ensure that your rights are protected on the road, keep our phone number available and call immediately if you are pulled over for a DUI. You can reach our Tucson office at (520) 623-4387.